I have the most amazing boyfriend. He is great with my son, he’s patient when I’m moody, and he is an excellent cook who makes dinner just about every night. But here’s the thing: When it comes to gift-giving, he’s the absolute worst. I have drawers and closets filled with junk that he’s gifted me over the years — things that I will never, ever use. I keep it all so I won’t hurt his feelings, but the last time I found myself cleaning out the closet only to find two bird-themed knickknacks he bought for me at CVS, I finally reached my limit. Here I am trying to save his feelings from getting hurt, but what about my feelings? Every time I open a previously owned DVD or an old cell phone that he picked up at the Best Buy Clearance bin, all I feel is disappointment, even anger, depending on how much money I think he wasted on such a useless, thoughtless item. In fact, his gift-giving is so notoriously awful that my girlfriends rush to ask what I get on every gift-giving holiday, knowing the answer will make them feel better about their generic gift cards and droopy flowers. For Mother’s Day this year, for example, he gave me a $20 portable speaker. Sure, it’s nice, but it’s so not me, which perhaps is the part that perplexes me most. How is it possible that he has no clue what I’d like despite all of my hints over the years? 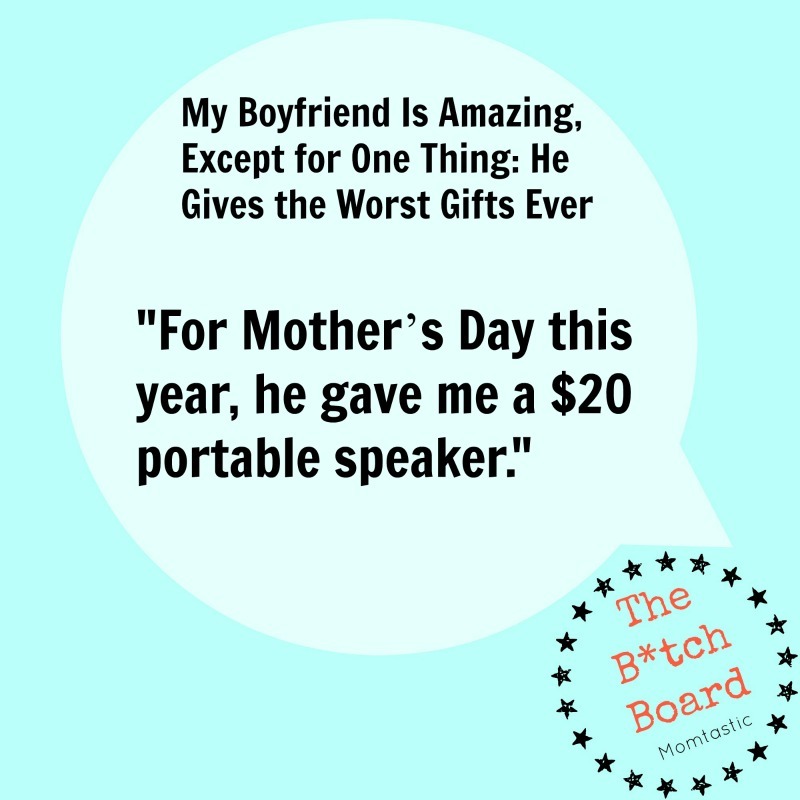 The worst part is that he ran out to buy the speaker on Mother’s Day morning, ruining our breakfast plans (what I really wanted was his famous French toast). And, his last-minute shopping trip held us up from going to the beach, the one thing I wanted to do. (By the time we arrived, half the day was over — and the speaker wouldn’t work.) Sure, he probably thought that he was doing something nice for me, but instead, he sent a clear signal that finding the perfect gift for my special day was nowhere near his list of priorities that week. The list of crappy gift-giving examples doesn’t end there. Last year for my birthday, he gave me a barbecue grill and a flat-screen television. For a second I thought he had confused the date with Father’s Day and bought something for himself. Another year he spent all of Christmas Eve at the mall, forcing us to push back our dinner plans so he could sort through the picked-over racks of women’s clothes. I ended up with extra large pajamas that my grandmother coveted and cubic zirconia earrings from Marshall’s (the clearance tag was still on it). Seriously, is it that difficult to be thoughtful? It’s hard for me to believe that birthdays and anniversaries can sneak up on you, given that the dates are plastered on everything from laptops to cell phones to Facebook posts. Certainly Christmas doesn’t arrive without its share of warning. From commercials to twinkling lights to signs and sales everywhere, it’s hard to understand how the holidays could grab anyone by surprise…especially year after year. For a long time I felt like a brat every time I opened one of his surprises, like I was too much into material things — but I’m done with those feelings. I understand that not everyone is into gifts, but I am into gifts, and there’s nothing wrong with that! In fact, gift-giving is so important to some people (like me! ), it’s one of the 5 Love Languages. You don’t have to spend tons of cash or even time to make someone feel special. Write more than just, “Happy Birthday. 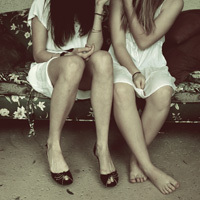 I love you.” on my next birthday card. Turn a regular meal into a candlelit picnic in the living room. I don’t care if it’s a cliché gift card to a spa or DSW, just think of something I might enjoy for a change. And for goodness sake, don’t run out to buy it five minutes before you hand it to me.